The romance drama comes to an end in...Single and Married Ghanaian Movie [Part 2], now showing on Nigeria Movie Network. The movie stars Yvonne Nelson, Nadia Buari, Kofi Adjorlolo, Chris Attoh, Jane "Efya" Awindor, Kweku Elliot, Eddy Watson, among others. Watch, Comment and Share on your social networks! Movie Plot: Three recently married female friends, all with challenges within their marriages embark on a journey to discover what it is that it takes to make a marriage succeed. Do you think Yvonne Nelson and Chris Attoh will make a perfect match? You cannot be certain. Only one way to find out. 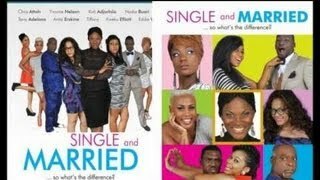 Single and Married Ghana Movie tells the story of three recently married female friends, all with challenges within their marriages embark on a journey to discover what it is that it takes to make a marriage succeed. I can't see the film only the audio why?